Located in southeastern Utah, Canyonlands National Park preserves more than 337,000 acres of land containing a pristine high desert atmosphere. Visitors will experience breathtaking colors spread throughout a rugged landscape just begging for adventure seekers. Hike or drive (if possible) through natural and primitive desert land filled with gorgeous canyons, mesas, buttes, fins, arches, and spires. 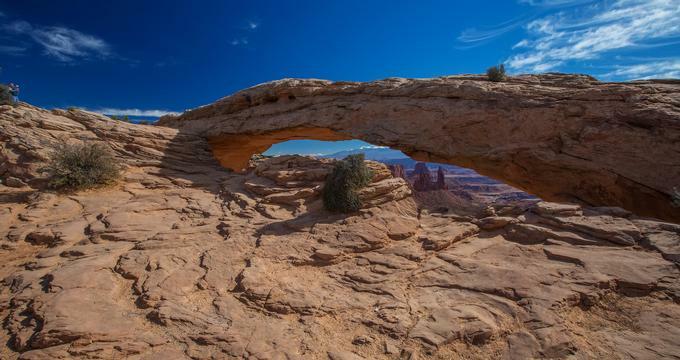 There is too much to see in Canyonlands National Park to visit only once. The history of the Canyonlands is vast and has been influenced by many groups of people, including Native Americans, European explorers, miners, and ranchers. However, it was most influenced by Bates Wilson and Stewart Udall, the founders who turned the area into a national park, preserving it for generations to come. Bates Wilson was the Arches National Monument superintendent during the 1950s and 1960s. He advocated the creation of the park and sealed the deal by giving jeep tours to government officials. These tours were complete with campfires chats and hearty dinners deep in the desert. Stewart Udall attended one of these tours and helped push the legislation to establish Canyonlands a National Park. A bill was introduced by Utah Senator Frank Moss in 1962 to accomplish just that – it was entitled A Proposed Canyonlands National Park. President Lyndon B. Johnson signed a public law on September 12, 1964, which officially established the Canyonlands as a National Park. The Canyonlands was expanded in 1971, when it obtained the Maze, the Land of Standing Rocks, and the Davis and Laender Canyons – making the park a whopping 337,598 acres today. Island in the Sky & White Rim Road: This is the most accessible area of Canyonlands National Park; it offers many expansive, spectacular views from various overlooks and its scenic access route – White Rim Road. Hikers, bikers, or visitors with four-wheelers can choose from a variety of scenic routes and trails to reach the top of the mesa, which rests on sandstone cliffs positioned more than 1,000 feet above the surrounding area. Park rangers conduct tours and other activities from the months of March through October. There is a campground available all year round at the Willow Flat Campground near the visitors center. The Needles: Forming the southeast corner of the Canyonlands, the Needles dominate the area and received their name because of their colorful spires made of Cedar Mesa Sandstone. There are many hiking trails, biking routes, and scenic drives for four-wheelers and cars. The featured overlooks are Tower Ruin, Confluence Overlook, Elephant Hill, the Joint Trail, and Chesler Park. The Needles Campground has two sites – Loop A is open all year round and Loop B is open spring through fall. Park rangers will often give presentations at the campground at night. The Maze & The Orange Cliffs Unit: This area is aptly named as it is the least accessible area of Canyonlands National Park. It is extremely remote, requiring visitors to access it by foot most of the time. The travel time is quite long and visitors must have basic wilderness and outdoor self-sufficiency skills. Though the trip and the terrain may be rough, the view is spectacular. The gorgeous cliffs, open plains, and colors are so breathtaking that visitors won’t want to leave. The Orange Cliffs and the Chocolate Drops are not to be missed. Horseshoe Canyon Unit: This area contains some of the most significant and well-preserved rock art in the country. The Great Gallery is filled with life-size figures with extremely intricate designs that are sure to impress visitors. The area is also filled with beautiful wildflowers, sandstone walls, and a flowing stream at the bottom of the canyon. This area is prime for hiking, and guided tours are given daily during the spring and fall. Camping is allowed although pets are prohibited. The Rivers: This area is home to the Green River and the Colorado River. Visitors can participate in flatwater and whitewater rafting trips along either. Cataract Canyon is 14 miles of rapids and is particularly hazardous water for inexperienced rafters. There are hiking trails along Cataract Canyon as well, however, lightweight boats and inflatables are not allowed.